Marla Broadfoot has a very nice article in Nature News about the results reported in our newly published paper. The results indicated that the majority of the respondents (57%) were out to half or more of their colleagues, a greater proportion than the 47% of people who said they were out in a 2014 survey of the general US workforce by the Human Rights Campaign Foundation in Washington DC. Broadfoot includes quotes from Jeremy and from Kristen Renn, who has done important research on the experiences of minority students in higher education. Go read the whole thing. 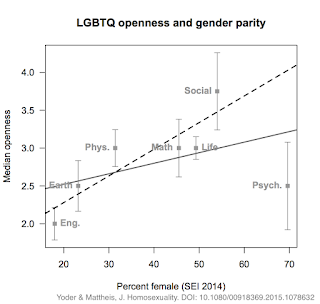 A survey of individuals working in science, technology, engineering, and mathematics (STEM) fields who identify as lesbian, gay, bisexual, trans*, queer, or asexual (LGTBQA) was administered online in 2013. Participants completed a 58-item questionnaire to report their professional areas of expertise, levels of education, geographic location, and gender and sexual identities, and rated their work and social communities as welcoming or hostile to queer identities. 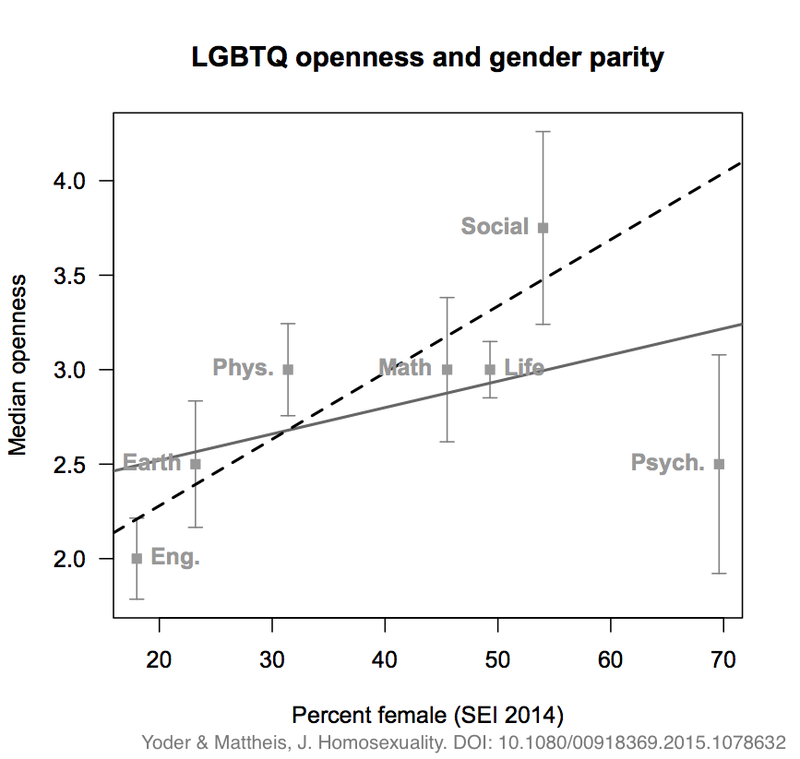 An analysis of 1,427 responses to this survey provided the first broad portrait of this population, and revealed trends related to workplace practices that can inform efforts to improve queer inclusivity in STEM workplaces. However, the paper has the benefit of review and comments by experts with knowledge of the broader research context for the results, and includes one big points we haven't made in other print venues. In particular, following an analysis prompted by the reviewers, we found that survey participants who worked in STEM fields with better representation of women were more likely to be out to their colleagues. This is an interesting result because it suggests a broader phenomenon of gendered culture in STEM workplaces — in fields with fewer women, the climate may be less comfortable for anyone who fails to conform to a straight male gender presentation. This is an issue we're interested in pursuing in further analysis of the survey results, particularly the individual interviews with participants. The paper is available on the journal website, and in an easier-to-read manuscript format PDF via Jeremy's online publications list.